1st. Infantry Division Report on "Operation Elephant", Palestine, 1947. Printed by Survey of Palestine, [Jerusalem? ], April 1947. "Operation Hippopotamus" and "Operation Elephant" were the names given by the British authorities to the military curfew imposed on Tel Aviv and Jerusalem in response to actions by the Irgun and Lehi in the years 1946-1947. The operation, meticulously planned months in advance, was meant to force the Jewish public to hand in members of these paramilitary groups. It included the cessation of bus traffic, closing of the courts, cessation of mail and telephone services and a prohibition on leaving one's home during night hours. Despite the operation, the paramilitary groups continued to carry out dozens of missions while the curfew was in place. On March 17, 1947, about two weeks after it began, the British decided to end the operation. The present item is the official report written by the commanders of the First Infantry Division, the unit responsible for imposing the curfew, in April 1947. The report includes, among other things, a witness statement by Richard Gale, the division's commander; English translations of articles from Hebrew newspapers; a survey of the preliminary planning and the execution of the curfew; diagrams of central streets in Tel Aviv with markings of passageways and entrances; maps with markings of telephone switchboards near the major cities; a list of telephone numbers of Jewish institutions; and other topics. In addition, at the end of the report are three large maps showing the area of the curfew, the forces' arrangement, and places where the paramilitary groups were able to carry out operations against the British army. 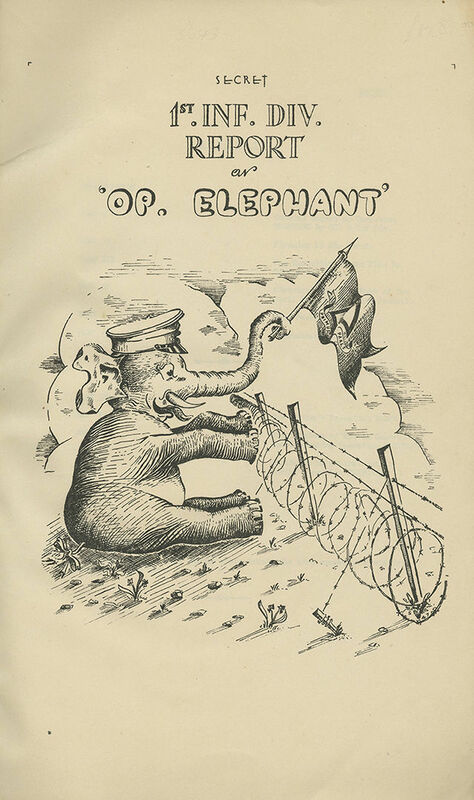 At the beginning of the report is an illustrated title page showing an elephant wearing a policeman's hat, waving the unit's flag with his trunk. Numbered with an ink stamp on the front cover: 134 (the end of the report contains instructions for distribution among the different units. According to these instructions, only 200 copies in total were printed). Printed on the front cover and on top of each page is the classification: Secret. , 145 pp +  folded maps and  folded index, 30 cm. Good condition. Stains, creases and minor blemishes (mostly to cover). Small tears to seam between title page and following leaf. Small marginal tear to one of the maps.